This gorgeous bedroom designed by the talented Ann Lowengart is right up my alley! Unsurprisingly, the beautiful marble motif wallpaper is the first thing that catches my eye. It's bold, striking and makes a great backdrop in the room. 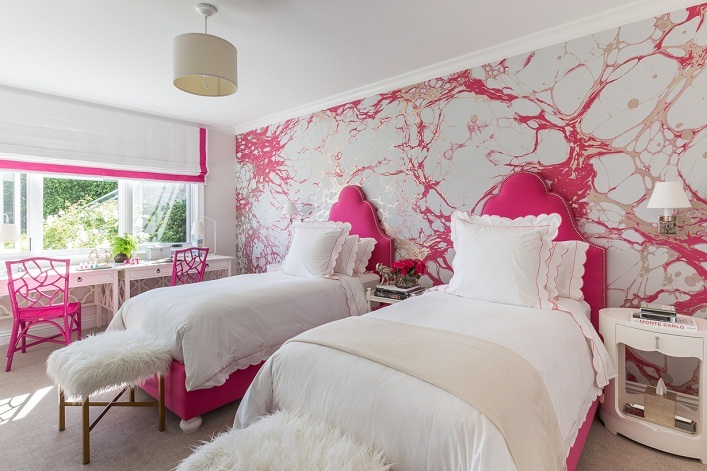 I am also in love with the pretty fuschia headboards. I like how the designer cleverly incorporated the lovely scalloped shams and bedding to mimic the curves on the headboards for a sense of flow and cohesiveness. The fur benches at the end of the bed provide warmth, textures and softness to the room. The writing desks and chairs are wonderful, practical additions to the space allowing some work to be done without having to leave the room. An effortlessly chic, stunning and thoughtfully designed space, what's not to love about this fabulous bedroom? Your thoughts? WOW. This room is truly worthy of ROOM OF THE WEEK!! !